Happy SysAdmin Day folks! We hope you get recognised for the true superhero that you are! Lets face it, only superheros can juggle multiple projects, constantly put out IT fires, and smash out one support ticket after another. We salute you! Whilst you are taking a well earned break today, why don't you tell us about the IT miracles you performed in the background over the past year that your end-users were not aware of but you saved the day. 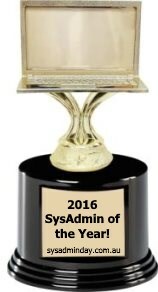 Entries for the Australian SysAdmin of the Year close tonight 29th July 2016 11:59pm AEST. Good luck!